Christina panics that she's caused a costly error at Lassiter's - she begs Caroline not to tell Paul but just then he walks in. Adam is dictating some medical stuff to Pam who is typing it on an old- fashioned typewriter (bless). He compliments her on her medical knowledge. Doug comes in and tells Pam that he's taking her away for the weekend - he's got two free tickets to a guesthouse in the mountains. Pam groans and says they need money from Doug's clients, not freebies! Apparently it's only about 40 minutes away though so Pam agrees. Doug worries about Adam though - how will he change his dressing? But Adam says he'll get Cody or Caroline to do it - and anyway, the accident wasn't Doug's fault and he doesn't blame him for it. Cody asks Pam if she can have some friends over for a slumber party while they're away, but Doug overhears and tells her there's no chance! Cody begs so hard he gives in, but Pam says they're not allowed any boys. Not even Todd. Caroline has sorted out the error - there's space available for the dentist on the next flight to Canada for no extra cost. Christina is very relieved. Caroline tells Christina that she's just not equipped for the job and it would be unfair on the company for her to keep working there. Cody and Melissa are planning the guest list for the slumber party. Todd and Josh roll their eyes and says they'll have more fun by themselves anyway. Christina approaches Paul and tells him she wants to go back to the gift shop. 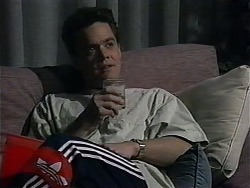 Paul is suspicious and wonders if Caroline has put Christina up to it. Christina insists that it's her own desire. Paul agrees and says he'll have to find someone else to do Melanie's job. In the kitchen, Caroline tells Christina that she'll have to make up with Melanie. Christina says it won't be easy - especially as Melanie was right! 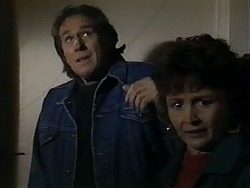 Pam and Doug have arrived to find a dilapidated guest house covered in cobwebs. Oh dear. But they start to laugh and make the best of it. They wonder how Cody is getting on and what trouble she's getting into! Cody, Melissa and various other assorted girls are listening to music in the living room. (One of them appear to be Phoebe Bright in a previous incarnation!) Adam heads off out, telling them to keep out of trouble. When he's gone, the girls decide to play truth or dare. 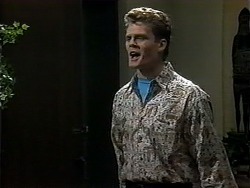 Their screams echo around Ramsay Street! 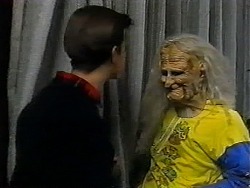 Caroline comes around to see Melanie, who is wearing a face pack! She invites Melanie around for dinner and tells Melanie that she and Christina should make up. Melanie says Christina took her job so she's still put out. Paul tells Adam that he really needs Melanie back because he's had some terrible temps. 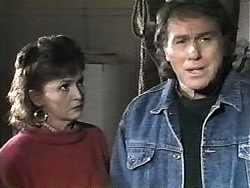 Christina tells Paul that she and Melanie have fallen out. The slumber party is somewhat out of control and the girls are laughing when suddenly they hear murderous screams from outside (Josh and Todd!) One of the girls (Bianca) goes to the window, sees Josh in the mask, and screams! The girls are trying to reason with Bianca that she couldn't have seen a demon outside the window, and tell her that she's just trying to avoid the truth or dare question. The girls decide that she'll have to go outside for 5 minutes as the dare. Bianca creeps out looking very scared. Josh jumps out on her and she screams! 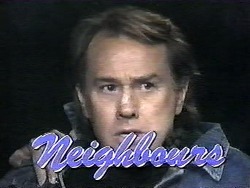 Bianca rushes in saying that there's a prowler outside and he went into No.24's back yard! All the girls panic. Pam and Doug have been out to a restaurant. Pam wants to ring Cody to "check she didn't leave the oven on". Pam wants Doug to drive home to check out of things. Doug says the ute is out of action, so Pam tells him he'll have to borrow the caretaker's car. 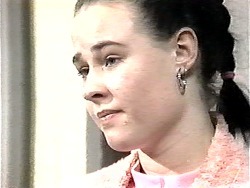 Melanie arrives and Caroline greets her enthusiastically, then tells Paul to grovel to Melanie. PAUL:(literally on his knees) Melanie...all is forgiven, would you please come back to work for me?! MELANIE: OK! ...on two conditions. The first is that you give me two weeks more annual leave to cover all the overtime you don't pay me for and second that you pay me $3,000 more a year. Caroline tells Paul that he underpays Melanie anyway and forces him to agree! Then, in the kitchen, Caroline tells Melanie and Christina to make up! Doug has arrived and goes around the back of the house. Doug has dropped his keys in the garden and Josh and Todd see him through the window. Meanwhile, the police have arrived (Cody reported a prowler) and come up to Doug! 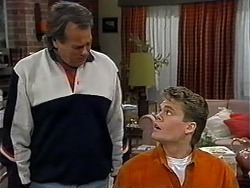 The police bring Doug to the door and tell Cody that Doug claims to live here but that he's not carrying any identification. 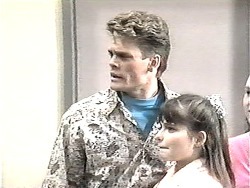 CODY: I'm sorry, I've never seen this man before in my life. He must be the prowler! Just then Adam arrives home and also gets in on the act! ADAM: I don't know who he is!